We have recently discovered this video taken from the Silver Jubilee Flower Festival in June 1987. Note previous rectors taking part - Jack Woods, Hugh Barker, Tony Treen and we believe also Rev Cox, who was Jack Woods predecessor. The cost of maintaining so large and lovely a church falls heavily on a small parish. Visitors to the church are often very generous but in 1963 to help raise the necessary funds, one of England's first major church flower festivals was arranged in the church and it grounds. 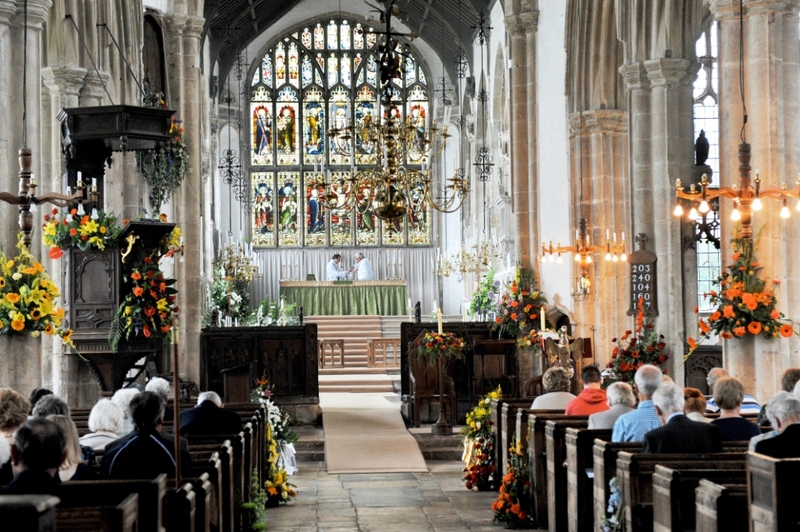 It soon became a very popular annual event, and although many churches now have flower festivals, visitors confess that none is as inspiring as ours. At first it was held over two consecutive weekends in June, but now it runs for five days from the first Saturday in June. Each year a new theme is developed and that is used for a breathtaking array of flower arrangements throughout the length and breadth (and, in some case places, the height) of the church. Many of the best flower arrangers in the region are involved every year, and the result is often humorous and always beautiful. Entry is free, although many visitors leave generous donations, and much of the income is raised through tombolas and prize draws, stalls which sell flowers, plants, local fruit and vegetables, home-made cakes and preserves, second hand books. clothing and bric-a-brac, and through the provision of lunches and a tea tent. Dozens of people throughout the village, and beyond are involved in this massive undertaking, and the organisation of the next year's festival starts soon after the last one has finished.